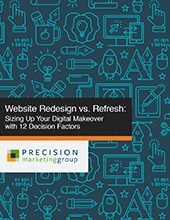 Does your website really require a complete redesign? Or can you save yourself some serious time, money and energy with a simple refresh? Is your website generating the results you expect? Is it profitably contributing to your business? A website is, no doubt, one of the most valuable marketing tools any company can have. But when your site is consistently letting you down, you might jump to the conclusion that you need to invest in a redesign. Is a website redesign or refresh in the cards for you? You’re about to find out. Simply fill out the form to access the free guide!